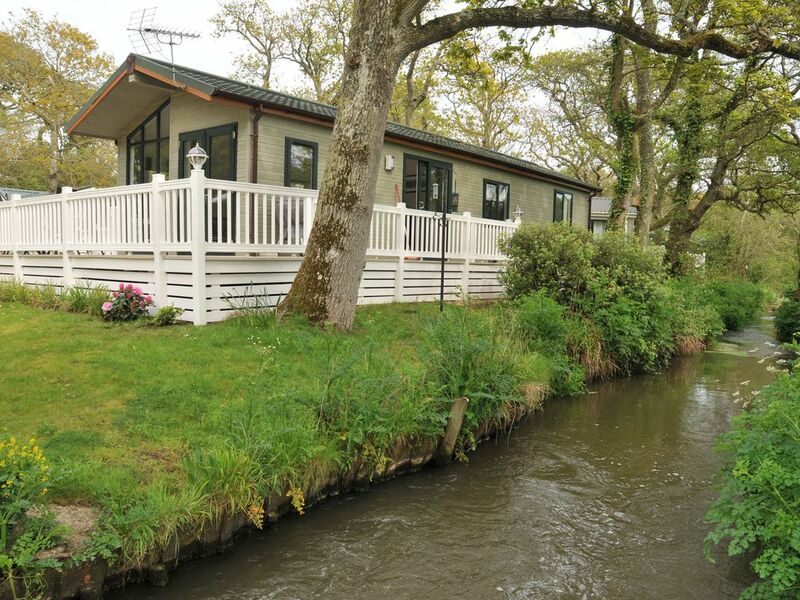 2 Bedroom Luxury Streamside Lodge situated in a quiet location on an award winning country park. Fully equipped kitchen, Smart TV, Netflix, DVD, free Wi-Fi, streamside deck and barbecue. Just 5 minutes walk from the sea and 5 minutes drive from the New Forest. The perfect place to relax and unwind in a tranquil location. On-site indoor and outdoor swimming pools, gym, day spa, shop, bar/restaurant and family/children's entertainment - (daily/weekly membership available form park reception). 2 Bedrooms/2 bathrooms. Mark and Tracey live in Barton on Sea, Hampshire, just a short drive from Shorefield Park. After visiting the area from our home in Oxfordshire for 3 years we loved the area so much we decided to move here permanently. We fell in love with Shorefield and Milford on Sea when we visited in 2011. As soon as we saw the stream side vacant pitch we reserved it and set about finding the perfect lodge to fill it. In April 2012 our brand new Pathfinder holiday lodge was completed with a range of custom features to take advantage of the unique location. Although the lodge is on a large country park with lots of amenities the location is extremely peaceful and quiet (apart form the sound of the stream running by) and is a great place to watch the local birds and wildlife. Wildlife we have seen from the lodge includes rabbits, squirrels, roe deer, pole cat. Some of the many birds we regularly see are greater spotted woodpecker, green woodpecker, nuthatches, buzzards, sparrow hawk, moorhens, mallards, little egrets, grey wagtails, bullfinches, goldfinches and treecreepers. If you are lucky you can also spot kingfishers along the stream-side woodland walk into town. Both bathrooms with wash basin, WC and thermostatic controlled showers. All towels and bed linen provided. Fully equipped kitchen with fridge/freezer, dish washer, microwave, electric cooker/gas hob and washing machine. Barton-on-Sea cliff top, sea view golf course 1 mile away. Outside: Large deck on 2 sides of property with table and chairs. Webber charcoal barbecue. External deck lighting. Streamside/woodland location ideal for viewing wildlife and birdlife. Overlooks large open grassed area. Cleaning / Towels / Linen / Maid service: Bed linen and towels provided. Cleaned throughout before each guest stay. Lovely stay over Easter break. The lodge is in a cul de sac over a little bridge which made it quiet and peaceful. The lodge itself was clean and cozy for all four of us. Tracey is a great host and was in touch with us in the lead up to check-in and answered all my random questions. During our stay we had a slight problem with the freezer which was quickly rectified. We signed up for use of the pool and had 2 days of swimming and enjoyed winning in the arcade! It was all that we wanted and needed for our short break! Lovely lodge in an idyllic location. Amazing weather for the time of year, relaxing on the verandah with a glass of wine soaking up the surroundings was wonderful. Many thanks! Really lovely lodge, in a great location. Inside the lodge was spotlessly clean and very well equipped, we couldn't fault it. Will certainly be back for another stay. Cleanliness not good both inside and out. Good left in fridge and cupboards. Pots and pans dirty. Items of clothing left in wardrobe (eg)children’s shorts. In correct contact details for property owner. Separate complaint and photos will be placed on home away website. Great lodge, plenty of space for us as there was just the two of us. The second bedroom looked a bit cramped but we diddn't use it. The area was very quiet and we slept very well. We enjoyed some lovely walks in the new forest and the lodge is less than 20 minutes from lymington where we got the ferry to the isle of wight for the day. Would highly recommend this lodge. The only issue was that we could not get a mobile phone signal though we found a couple of spots on the last day where we managed to get one though thats no fault of the owners. There was wifi though. Thanks so much Brian I hope to welcome you and your crew again next year! 5 minutes walk to Milford/Hordle pebble beach. Outstanding views across to the Isle of Wight Needles with cliff top walks to Milford on Sea (20 minutes) and Barton on Sea (30 minutes). Short drive east to Keyhaven sailing/nature reserve and west to Muddeford and Hengistbury beaches. 2 miles outside coastal village of Milford on Sea located between Lymington and Christchurch on the edge of the New Forest national park. 8 miles to Christchurch and 15 miles to Bournemouth. 2 hours drive from London. Lots of local coastal and country pubs. Wide range of family friendly restaurants and fine dining options in nearby Milford on Sea, Barton on Sea Christchurch and Lymington. Changeover Day: Friday changeover but can be flexible if required.